In 1985, Yogi Berra was brought back to manage the Yankees after an 87-win 1987 campaign. Steinbrenner wasn’t very happy with Berra’s laid back managing style. George wanted him in his players faces, but Berra would do nothing of the sort. After 16 games into the season, the club owned a 6-10 record and that was enough for George to let Yogi go. Billy returned, thinking that George would get off his back. Billy made a pact with Steinbrenner. The terms of the deal were that George could not enter the clubhouse or deliver speeches to the team, while Billy would have to fine players on a whim. And that’s exactly what Billy did. Peter Golenbock says: “He fined Phil Niekro for giving up a grand slam home run. 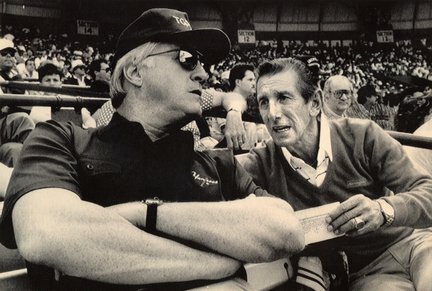 He fined Rich Bordi for not trimming his mustache, and he fined Bobby Meachem one time for swinging at the first pitch.” He goes onto say: “It got so bad that Niekro described Billy as “The Maddest of the Game’s Madmen.” By mid-season, Steinbrenner would be down his throat once again, causing Billy to continue drinking himself to death. If you haven’t read George: The Poor Little Rich Boy Who Built the Yankee Empire, I suggest you give it a read.